Redcar's first childrens hair salon has opened with a bang. With it's red racing car and pink and purple quad buggy, an alien chair and a flower chair and also a teen area. The friendly staff are amazing with the kids and have so much patience. This was not the experience we hoped for , appt over 1 hour late,no apology .she chose to look after regulars first !! Then got quite sharp when my little boy touched "expensive sink" . The whole place needs a good clean and towels in loo changing . I had to pay twice for carparking too. I ended up having to cut off the uneven bits on my boys hair myself. Never again!!!! I heard about tantrums from family who live in redcar and they suggested i take my son there, who hates getting his hair cut. We live a good 30 mins dive away so i phoned in the morning to book a appointment for that afternoon. After driving through, paying parking and arriving on time, my husband got told my son would have to wait 1hr to get his hair cut. I don't know about your children - but trying to contain a 2 yr old somewhere for an hr is hard enough - without then having to put them (and yourself) through an ordeal of a haircut. What a fabulous place. Our little boy hates having his haircut, and although he did cry a little, it wasn't half as bad as the last time we took him to the barbers. The relaxed and friendly atmosphere makes both parents and children feel at ease, no feelings of embarrassment or wishing the ground would swallow you up! I would recommend anyone to try here if their LO has a problem with haircuts. My son loves sitting in the race car for his hair cut, my daughter has been to a party there; it is a lovely relaxed atmosphere where nothing is too much trouble. Tantrums offer first hair cuts certificates which include photo of your child and a lock of their hair. Also their pamper parties are great, with hair-up, make-up and nails polished for girls and for the boys have their hair spiked and sprayed wacky temp colours! 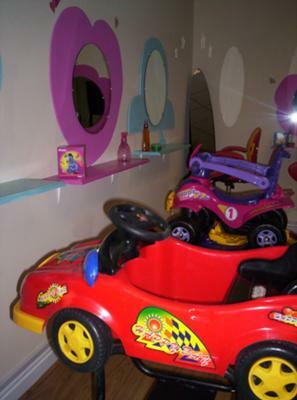 This is a relaxing atmosphere for your child where they can play in the play/waiting room before they get their hair done. Let Tantrums take care of your little tantrums!